Now into our 4th season sharing our Yoga on the Beach, in the Air with Aerial Yoga and on the Paddle Boards. Open to the public! Our full class schedule and online reservations can be found at www.YogaPaddler.com. You can prepay with Paypal. 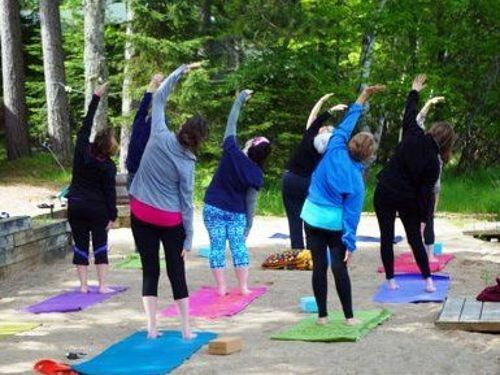 Our free annual open house is Saturday, June 2 from 10 am to 1 pm where you can participate in Beach Yoga, Stand Up Paddle Yoga, Core on the Board and Aerial Yoga with our instructors, Shanna and Karen. Classes commence the next week and continue for 13 weeks, longer if weather holds up. Beach Yoga: Bring your own mat or use one of ours. Beach yoga sessions are $12 each on a walkin basis. Bring a friend and you each pay only $10 a class. Save more with a 13-season pass for $114. Buy a Session Pass for you, and an extra one for guests and friends. The second pass is $84. Book online www.YogaPaddler.com to reserve your space. If we extend the program into September with mild weather, those classes are $7 each for folks who had summer season passes. Public Welcome! We never cancel as we have alternative space when the weather isn't agreeable to Yoga. Tuesdays and Fridays at 10am. These classes are an hour and a half in duration with an hour on the board in session and another half hour paddling to the dam & back. Participants are welcome to paddle longer if they wish for no additional fee. SUP courses are $19 each when you bring your own paddle board and $27 when renting a board. Bring a friend and you can both enjoy classes for $15 BYOB or $23 when renting. We are scheduled for 13 sessions, but anticipate the weather could cancel us out a few dates. Your pass is good for all 13, but priced for 10, giving you up to three free sessions. Season passes are $190 BYOBoard and $270 when renting a board. With up to 3 free classes included. Buy one season pass and the second pass is 30% off. SUP Yoga: Thursday 5:30 pm and Saturday 10 am. Core on the Board, 10 am Thursday. Aerial Yoga: This is a special apparatus class and held on the lawn in front of Cabin 6. This class requires advance registration and a minimum of 3 participants at $50 each to hold the class. Extra people are $35 each with a maximum of 5 total people. This class can be scheduled for a time of your convenience. 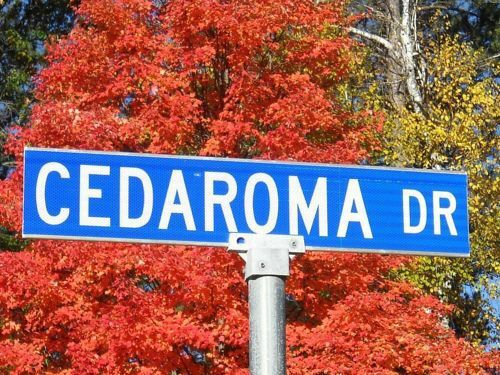 CEDAROMA LODGE RESORT GUESTS: get a 10% discount on any of our classes. For a 20% discount, book your beach, SUP or Aerial classes sessions when you book cabins. Just fill out the form below. Be sSre to let us now which classes you want us to package with your stay. Advance notice is recommended. Boards are rented on a first come first served basis.